Introducing the smartwatch that actually looks like a watch! With a circular face and a comfortable fit, the Moto 360 from Motorola features a timeless design that stays true to the form of a classic wristwatch. It runs on the Android Wear platform and delivers notifications from your phone straight to your wrist, including messages, weather alerts, flight notifications and more! The voice control feature will make the Moto 360 the perfect companion for those busy days. Simply say, "Ok Google," and you can then have your smartwatch follow your voice commands to send messages, get directions, set reminders, and schedule events in your calendar. The Moto 360 also makes it easier to maintain a healthy lifestyle thanks to Moto Body, a built-in activity tracker that also helps you meet your fitness goals. 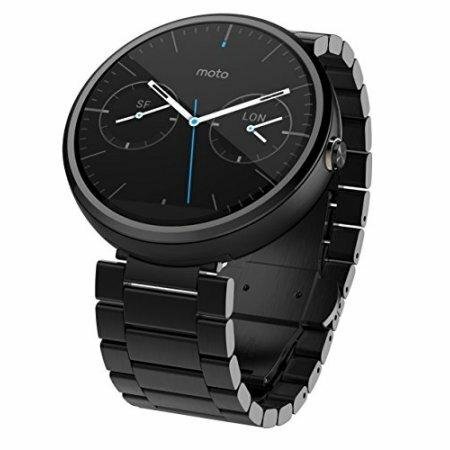 Best of all, the Moto 360 is customizable so you can switch out your metal wrist band for a leather one or choose a different style face for your smartwatch.